Batteries want to be charged. To achieve long battery life, the lead antimony battery requires frequent water additions to maintain proper electrolyte levels and the corrosion must be regularly removed from posts, cables, hold downs and battery trays. After you use your battery the most important thing is to charge it back up as soon as possible. When a battery drops to around 20% capacity or so and you do not charge it, sulfation starts to take place. 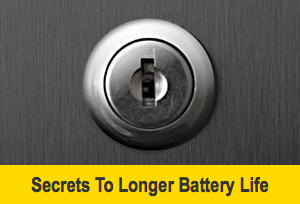 Battery De-Sulfater will save your battery from death by sulfating. If your battery does not have a busted or cracked plate it is just heating up and not charging, it is due to sulfation. Sulfation causes your plates to harden, which doesn’t let the acid return from the plates into the electrolyte when charging. By adding Battery De-Sulfater and then putting a slow charge on this sulfated battery, De-Sulfater will penetrate this sulfation, dissolve it and let the acid come back out of he plate. Corrosion is a silent killer. All batteries slowly self discharge as they are sitting. When you have corrosion your battery will self discharge even more quickly and once it gets to around 20%, sulfation will start to set in. It is very important to remove corrosion and to charge your batteries at least once every two months if you are not using them. This is why so many owners of boats, RV’s, lawn mowers, and motorcycles who live in cold climates find that their batteries are dead when it gets to be springtime. Never let the water level get below the tops of the plates. When you add water to your battery, always add distilled water, never tap water. Tap water contains minerals such as iron and elements like chlorine. If you let the water level get 1 inch below the plate, this part of the plate will now dry out and harden, which means you will lose some of your battery’s capacity. 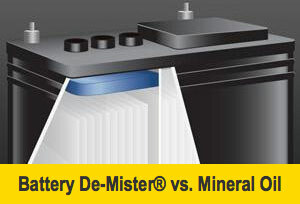 As a battery gets older it will use more water, so you should check older batteries more frequently. Batteries want to be charged… correctly. 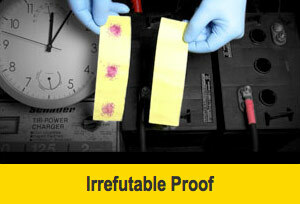 To get the longest life out of a deep cycle battery it should be charged no more than 10% of the amp hour rating. In other words, if you have a 100 amp battery, the ideal charge would be 10 amps, then tapering off eventually to a float charge. Always get the best quality batteries made. There are several especially good ones. Trojan and U.S. Battery Co. are two of them. When you purchase one of these batteries always get the most reserve capacity. Batteries that are discharged to a smaller percentage of the total reserve capacity last longer. Battery De-Mister will get you up to 3 times longer battery life. The battery oil will eliminate corrosion, and greatly reduce water consumption, explosion, sulfation and will let you get the full life out of the battery, which in many cases, is two to three times longer! The oil is lighter than acid & water so it will always float on top of the surface. When you discharge and charge a battery you will have all these little bubbles coming up to the top of the battery. When these bubbles reach the surface, they break up violently creating the gassing and the misting affect. Even though most of the water evaporates out, the bubbling process does atomize tiny droplets of acid, some of which settle on the top of the battery. This moisture attracts and holds onto airborne dirt, which eventually conducts power between the battery posts, corroding and electroplating them away. Because this mist is not coming out of the top of the battery the chemistry of the electrolyte remains the same while greatly reducing water consumption. When your battery tops stay dry (because the oil prevents this acid film from being carried out the top of the battery) it eliminates the corrosion. When you don’t have any corrosion the battery will fully charge and will also take longer to self discharge which in turn means it takes longer for it to get to the voltage required to sulfate. Because the oil slows down the gassing process you will not have as many gases present at one time, which in turn reduces the explosion factor. All of these things together help to get the full life out of your battery.